This was the only day that was relatively calm so far. 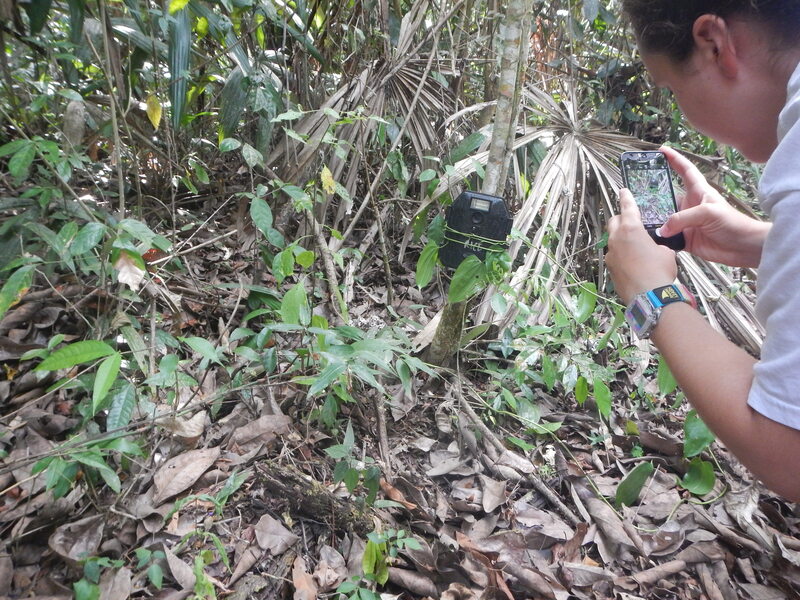 Effectively, we only did one activity (which is far less than we usually do) and this was retrieving our samples for our second project on nitrogen limitation in the rainforest. Yes, this is the pee one. After finding and tagging our urine and water vials, we went back to the lab and spent approximately four hours sorting throuhg the insects we found in the liquid, dividing them into different categories based on appearance alone. This meant we were each assigned an insect group, to keep the identification standardized across the whole project. I was assigned Orthoptera, as this is my regularly-assigned taxon, and this may as well have been the most Orthoptera I saw today. On our morning hike, there were no interesting Orthoptera organisms, though I did catch what seemed like a few quick, small crickets jumping throuhg the leaf litter. The lack of recorded Orthoptera for today may be partially due to the fact our morning hike was short, and I wasn’t paying close and particular attention to the leaves, since we were all preoccuped with collecting our samples. 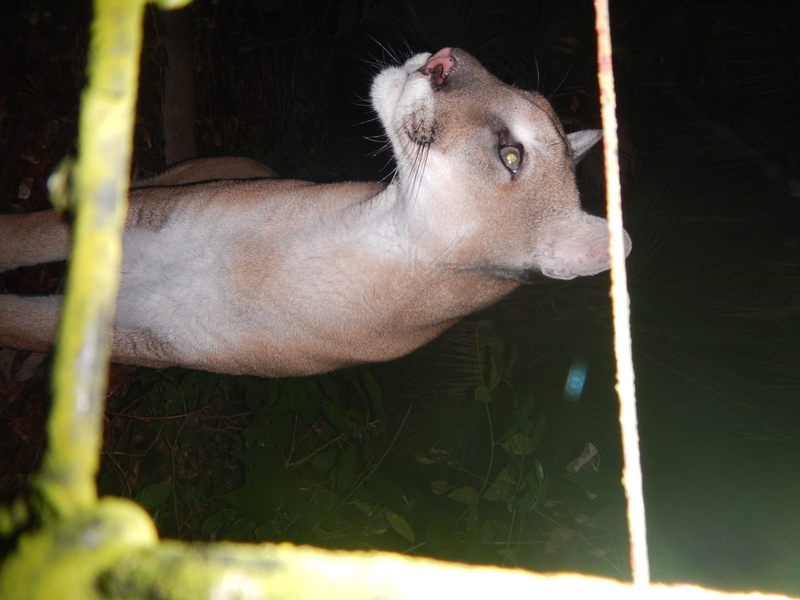 Halfway through our four-hour analysis, a second group arrived at Las Cuevas Research Station. They were college students, here to study ecology and biology like us. We somehow got offered the opportunity to present our project to them, so we did—standing at the front of the lecture lab, holding a poster titled “To Pee or Not to Pee”, discussing our day-long analysis in front of a group of strangers. They were sympathetic and seemed genuinely interested in our study, which was reassuring and honestly very sweet. It was a good (if not slightly eccentric) introduction to the first outsiders we’d seen in days. Besides this, it was a quiet day. At about 2 pm, it started raining in traditional rainforest fashion: brief, ephemeral torrents of rain, followed by open blue skies. 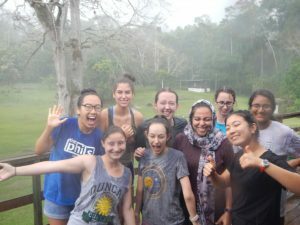 We all stood on the deck of Las Cuevas and basked in the falling rain. All of us standing in the rain at Las Cuevas. There were two main activites of the day—one involved urine and the other involved feces. The urine one: we collected our pee in the morning as a nitrogen source to entice the elusive insects of the forest. 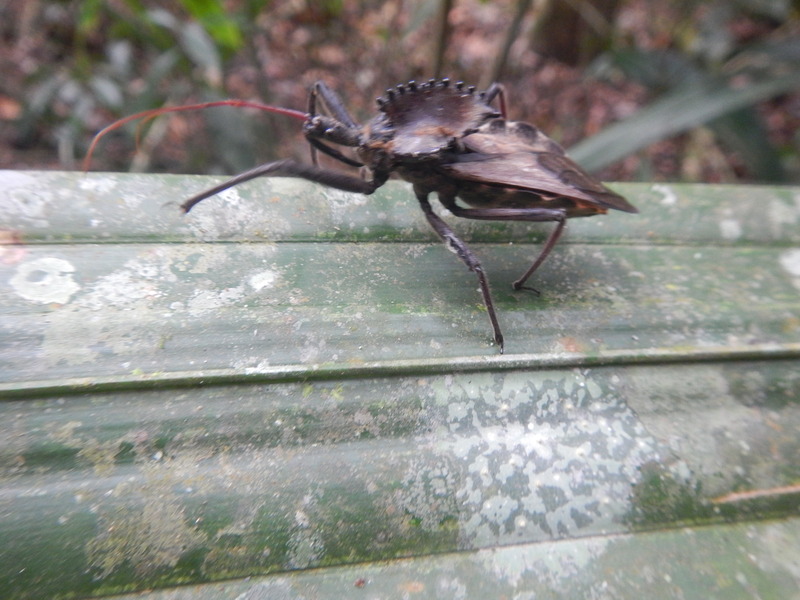 Essentially, we were comparing the diversity of insects between the canopy and the forest floor. 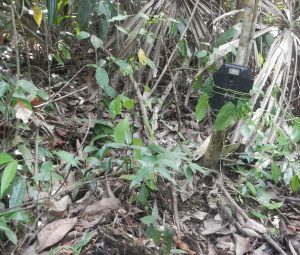 The urine (and a control sample of water) will attract some insects, and we can then quantify the insects and compare biodiversity between the locations. My Orthoptera of the day were plentiful: a small, striped one that looked like Cornops aquaticum (pictured below) but probably wasn’t because the latter tend to be found in semi-aquatic habitats; a beautiful red-winged grasshopper that I only saw fly away like a bird into the skies, scarlet wings beating; a lovely dull-brown katydid (that I touched! and then immediately un-touched) on a leaf in the jungle; and about four other smaller species that I didn’t know the names of. 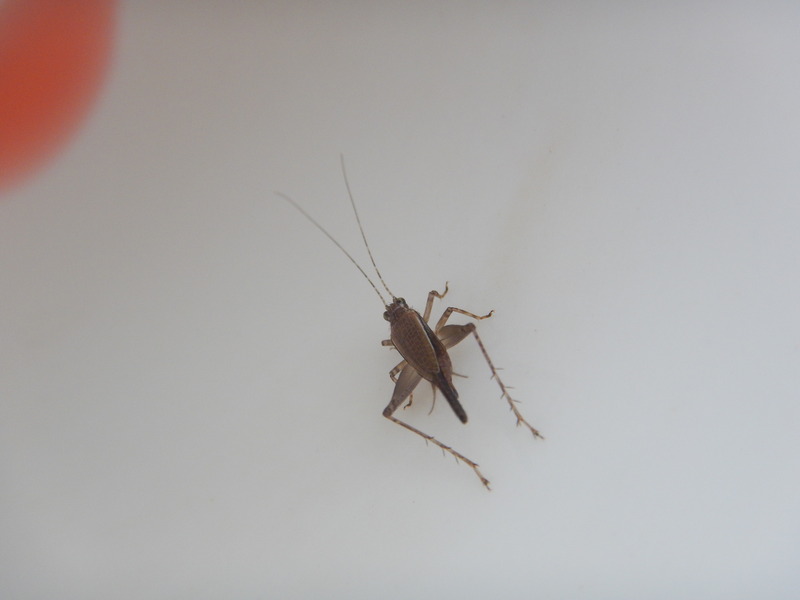 A fairly poorly-taken photo of the little cricket Adrienne found on the side of her cup. The highlight of the day was the caving, which took place in the afternoon. We headed into a local cave that almost no one goes into, and began our trek into the darkness. 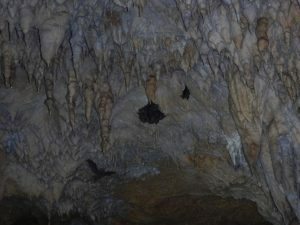 Honestly, I was more taken by the formations of stalactites and stalagmites (beautiful white crystalline structures, hanging like sharp teeth) than by the tiny biological life forms on the floor (which included worms, millipedes, isopods, ants, the like). 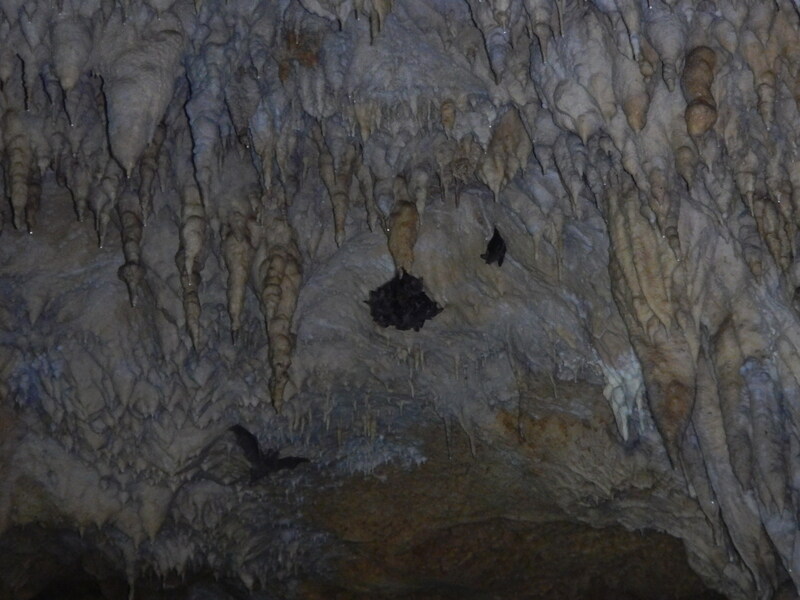 There were bats as well, important cave creatures, and we saw a whole flock of baby bats huddled together on the ceiling. There was a moment, a very good and unforgettable moment, of total darkness where we all turned off our lights. Something about it was surreal. I grinned the whole time, eyes wide staring into nothing. I swear to you I saw silhouettes of crickets carved into the darkness—this is the level of my imprinting. WE SAW A SNAKE TODAY. A very large one. 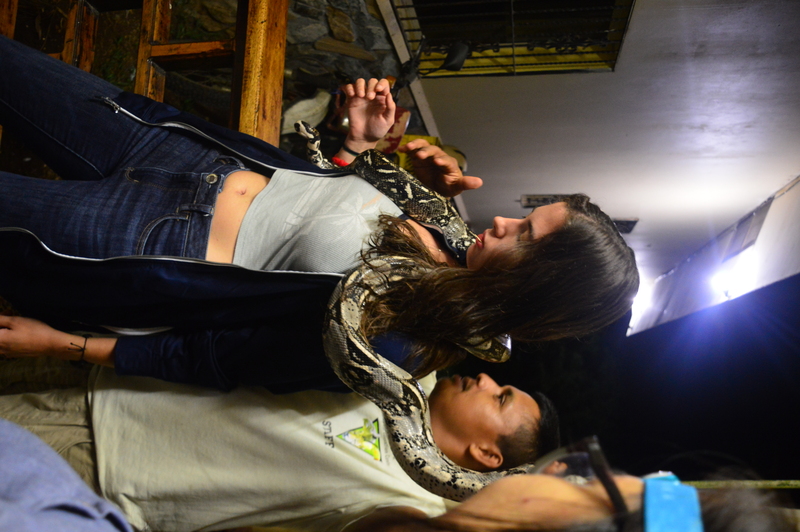 Boa constrictor. 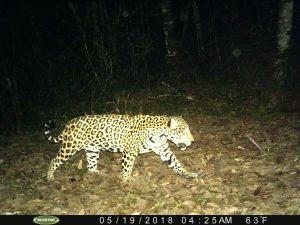 Maybe 5 feet? Very pretty, just laying on the ground across from a massive leaf-cutter ant’s nest. So I think that’s really it for me—that’s all I really came to see, thanks very much. 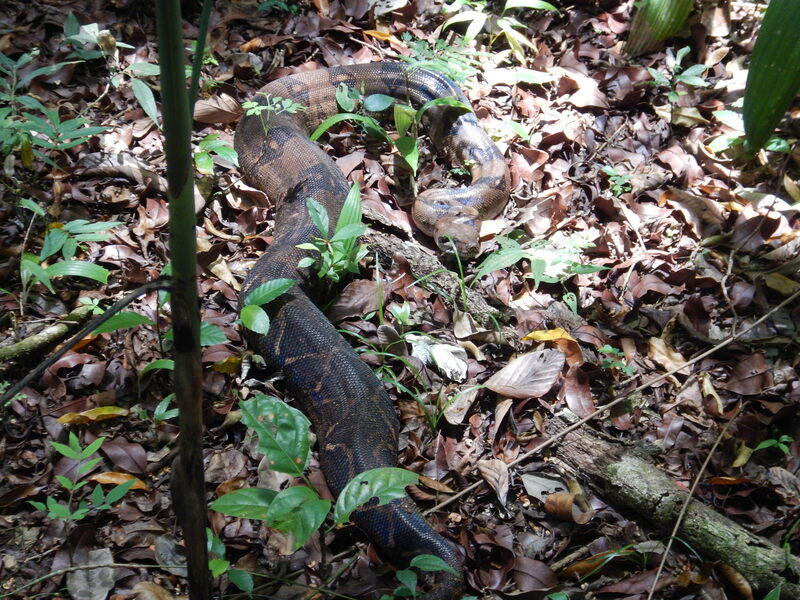 Seeing a snake in the wild is always a thrill, but a boa constrictor in the rain forest is just an unparalleled delight. I do admit the whole experience threw me right back into my on-and-off obsession with herpetology, and I spent the next few hours rolling over logs in the vague hope I’d see another slither out. 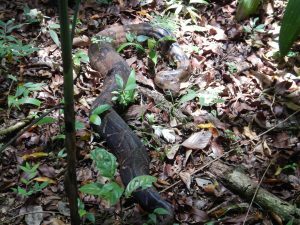 The boa constrictor we saw in the middle of the jungle. We encountered the boa while setting out the camera traps, which was our main project of the day. The project required that we set one camera facing the trail and another paired camera a few minutes off-trail, and this was where the real adventure was at. With Scott machete-ing a path through the thick jungle underbrush and blazing our trail, I felt like a proper Indiana Jones and decided right then to buy a machete as soon as the opportunity arose. The first time we went off trail I spotted my prettiest Orthotera yet—a lubber grasshopper nymph, about 2 cm across, black with abstractly placed yellow and orange stripes. 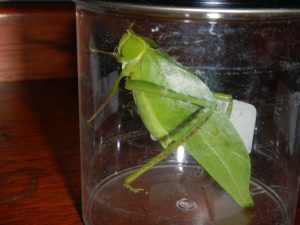 I caught it with a jar, and have it sitting atop my dresser right now, awaiting my Orthoptera lesson tomorrow where I’ll show it off. I’ve attached a picture of it and the quick sketch I made of its patterning. 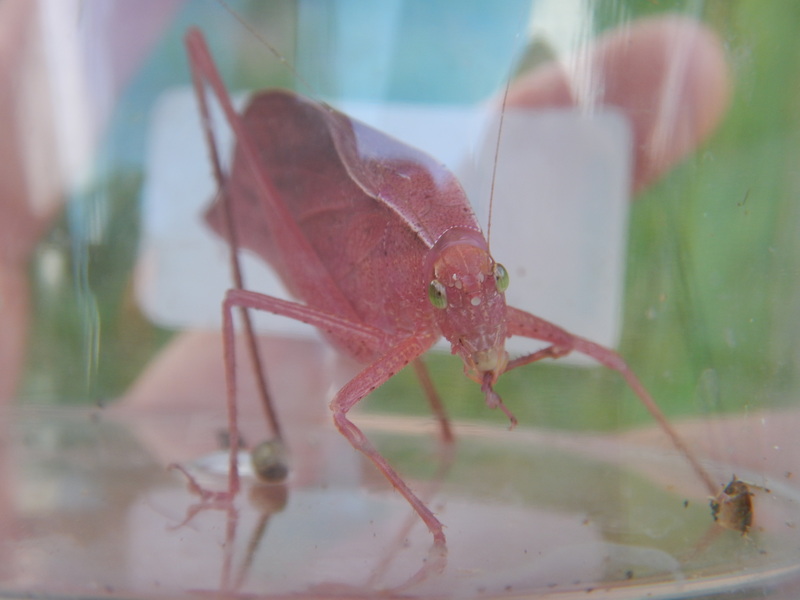 Additionally, someone else found a pink oblong-winged katydid (and as you know, katydids are by far my favorite Orthoptera). Apparently these are genetic mutants, and rare to find in the wild. I kept it for a while, watched it actively defecate in the jar, and then released it after feeling bad that I’d left it in a glass case filled with its own feces. I took a few pictures of it, and managed to snap the only actually-good, well-focused photo I’ve taken so far. The rare pink katydid we caught on the edges of the road. 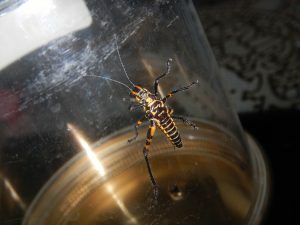 A lubber grasshopper nymph looking very pretty in this jar. As of yet I have not touched an Orthoptera, and this is starting to weigh on me psychologically. I feel slightly like an unloving mother. Maybe tomorrow the resolve will strengthen, but no promises. Today was a good day for Orthoptera. We headed out of Crystal Paradise and down to Las Cuevas, with a few pit stops in between—one of which was Rio-on Pools, a freshwater spring-like area that heavily lent itself to swimming. A cricket exoskeleton, black and white striped, was found there, but this was not the true hotspot of Orthoptera. The latter was at Caracol, a partially excavated Mayan dune. Here, I immediately encountered two grasshoppers, light brown with slightly striped abdomen and femurs. Though I couldn’t identify them in the field, looking at my taxon card they looked almost exactly the same as Lactista azteca, so that’s what I will consider them as. I saw two more of these atop the stones and in the grass of the Mayan structures. I attached a picture of the first view we got of the tall Mayan buildings, since that may have been one of the most breath-taking sights of the day. 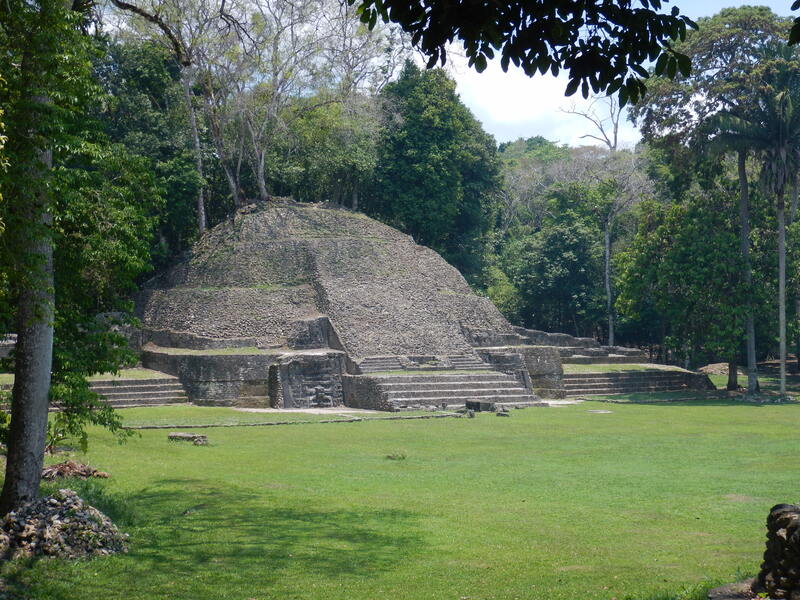 The exact first sight I saw of the Mayan ruins. Additionally, there was a monkey grasshopper, likely from the family Eumastacinae, on a leaf along one of the trails in Caracol. 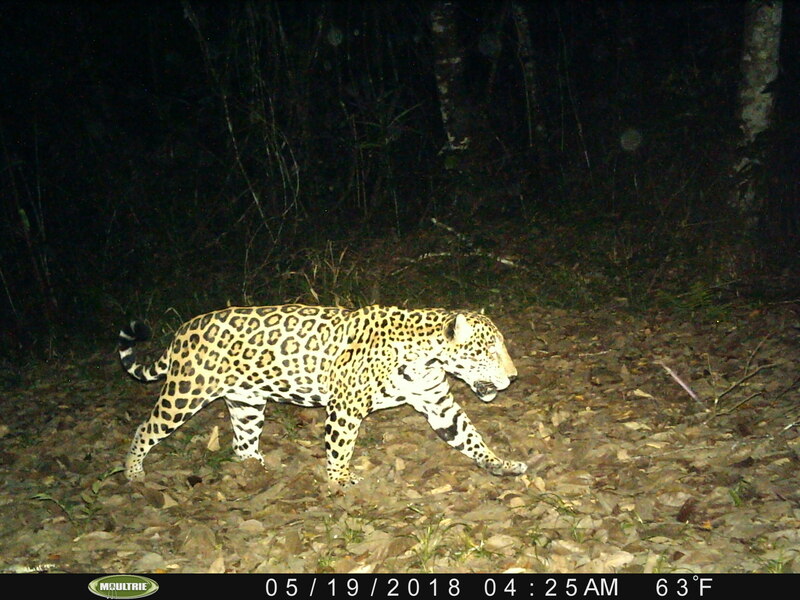 This one I did identify in the field, and given the distinctive 90 degree angle of the hind legs, I am at pretty sure my labeling is correct. Elena found a katydid, the first one on the trip so far, which was great as they are by far my favorite Orthoptera. 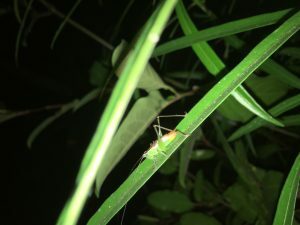 I think it was a leaf-mimic katydid, from the family Pterochrozinae. It did look exacty like a brown leaf, and was quite large, 5 cm long or so. After Caracol, we continued to Las Cuevas, which is beautiful if not slightly primitive in its facilities. 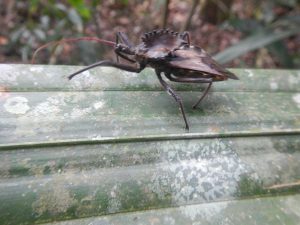 A walk in the rainforest refreshed my mind, despite the exhaustion of having woken up at 5 a.m. At night, we did our first lectures and lessons, and Scott found me a beautiful 7 or 8 cm green katydid he found outside Las Cuevas. A picture is attached of it in a mason jar, and I think it might be a greater angle-wing katydid. So in short it was a very good day for my crickets and their identifications. Hopefully this streak continues, though I have very little known species to base my identifications off of, and henceforth we have no Google. 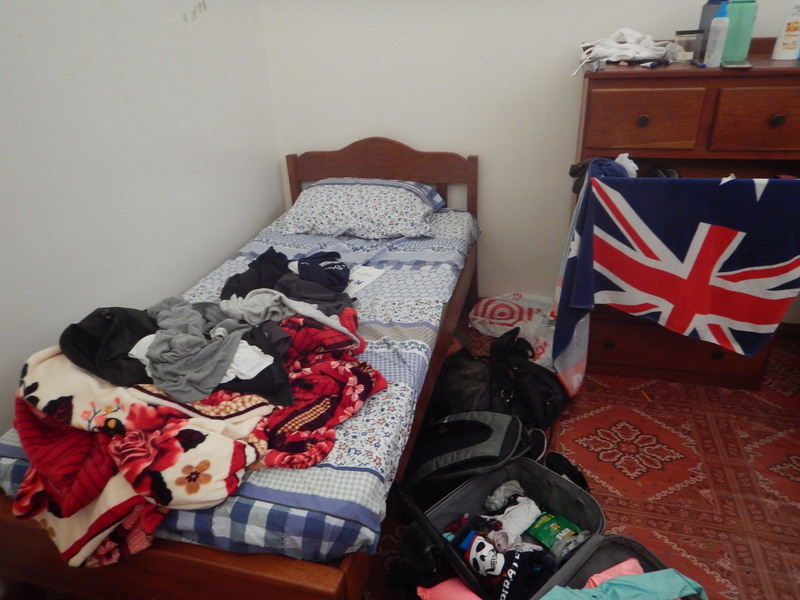 A picture of my very messy side of the room Sami took for some reason. Flying into Belize was similar to flying into Brazil, given the palm trees and rustic architecture and wide open blue skies. 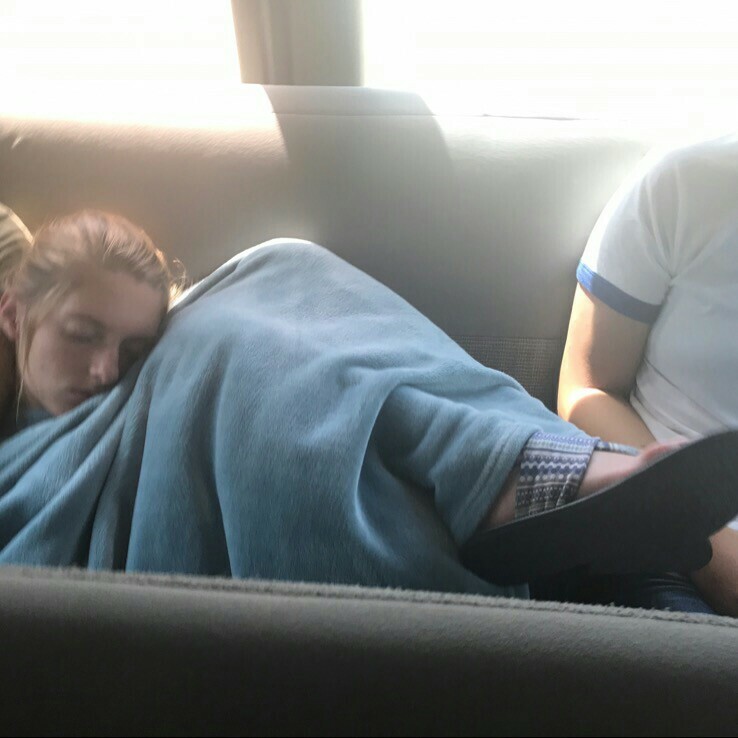 The airport felt familiar, the streets felt familiar, the people looked familiar, despite having never been to Belize. I breathed in the lack of American polish, the charm of the narrow, broken roads and the beauty of the uncropped environment. Somehow it felt like home, and I was quickly reminded of why I love the tropics more than any other place on earth. 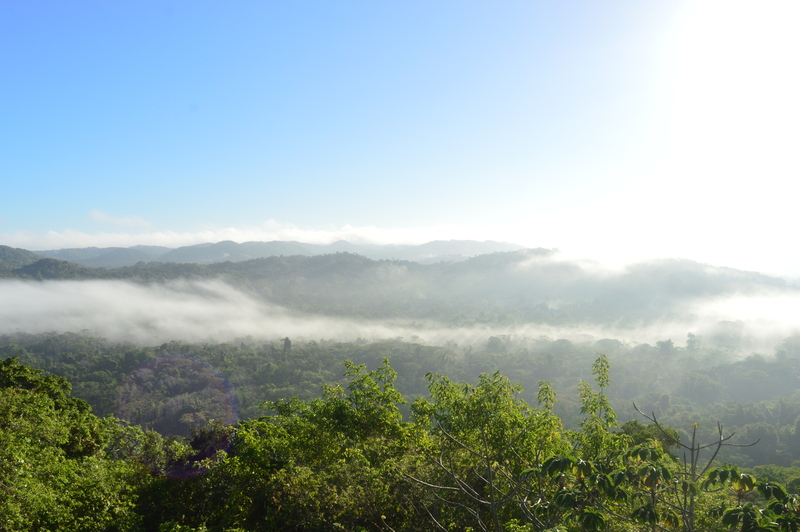 We flew in, landed smoothly, got in the van, and started our three hour trip to Crystal Paradise ecolodge. It’s a beautiful and well-run place, clearly meant for tourism, that feels and looks very similar to Anavilhanas, the ecolodge I stayed in when I went into the Amazon rainforest five years ago. Crickets were bountiful in volume. 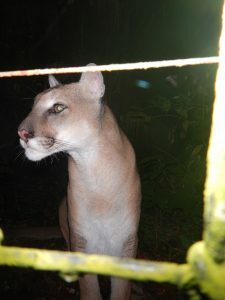 We arrived at night, and immediately I could hear crickets chirping, crafting the hum of the rainforest. 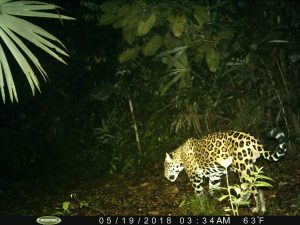 I got lucky and heard one on a very nearby bush. Upon further investigation, it was indeed a cricket, with long antennae and a well-camouflaged torso and head, but a red abdomen. Though I couldn’t identify the exact species, I assume it to be either in the superfamily Gryllidae or Gryllacrididae. I’m honestly quite nervous about being able to properly identify any cricket at all, and hope I get better as time passes. Attached is the best picture of the cricket I could obtain. A poorly-taken photo of my first up-close cricket of the trip. He was very noisy.